The operational life of one of Scotland’s two remaining nuclear power stations is to be extended by seven years. French energy giant EDF has unveiled plans to extend the lifespan of four nuclear power stations across the UK, including Torness in East Lothian. “Their excellent output shows that reliability is improving whilst their safety and environmental performance is higher than ever,” said EDF chief executive officer Vincent de Rivaz. The Scottish facility began generating electricity in 1988 with an original expected lifespan of 30 years. The firm said the plant, which was due for decommissioning in 2023, will stay open until at least 2030. It employs more than 700 people and produces enough power for two million homes. But environmentalists hit out at the move, branding it “bad news” for the country’s emissions goals and for democracy. 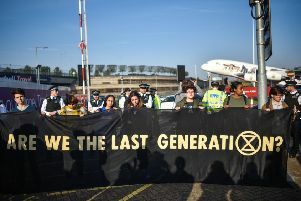 Sarah Beattie-Smith, infrastructure and investment spokeswoman for the Scottish Greens, said: “The fact that a private company can dictate energy policy for another seven years undermines democracy, both in the local community in East Lothian and nationally at a time when the Scottish Government ought to be focused on our ambitious climate targets. “Torness is almost 30 years old and we should be planning for its decommissioning. The Scottish Government is against new nuclear power plants being built north of the Border, but a spokesman said it backs extending the lifespan of existing facilities if “environmental and safety requirements continue to be met”. The announcement came as EDF, which also owns Hunterston B nuclear power station in North Ayrshire, announced a 68 per cent fall in profits. Dr Richard Dixon, director of Friends of the Earth Scotland, said the move was disappointing but “hardly a surprise”. He called for the UK to “refocus” on renewables and stop chasing “the nuclear dream”.